If we've learned anything from our recent two weeks away in Spain on the motorbikes, it's that time moves quicker the closer you get to the equator. Ergo, it gets slower the further you are away. Here at The Lodge time moves at around one quarter of the pace it should, although that's not necessarily A Bad Thing because it gives us more of an opportunity to do stuff. Before we left the shores of Old Blighty we were eagerly awaiting stuff to begin. The scaffolding had been up for a week or two, inspections done, the dangerous chimney stack was removed brick-by-brick and I had ripped away what turned out to be rotten bargeboards right across the front of the house. It was a shame that timings weren't better and that we'd have to leave the roofing and wotnot to move along unsupervised, but it was work. WORK! Two weeks later we returned to find that half the new stack had been built. The other half was completed a few days ago, but other than that not at lot has been going on, really. Where that could be seen as a problem for some people, we're okay with it. Our contractor has been really relaxed about things that need to be done and when decisions need to be made, so we've forced ourselves to step out of the Town Mentality and now we're pretty relaxed too. Time is quite fluid here. The main benefit is the scaffolding because it gives us plenty of time to find a solution for the new bargeboards. We also need to look at replacing a couple of rotten timbers up there at the same time. Then cost it. And we've just come back off holiday. So, with a heatwave well and truly under way here at The Lodge, here's where we are so far. Aka 'typing anything to avoid baking to death while stripping paint up the scaffolding'. The original stack, as explained in an earlier post, was trying to free itself in two directions from the constraints of being house-bound. Our chimney sweep had found evidence of a fire in the other chimney in days of yore, and that had cracked the brickwork badly. Our building/roofing contractor, in taking apart the old brickwork, saving all the good ones to be reused in the rebuild, also found evidence of a fire in this chimney, which had destroyed a very important section of the stack and its support. It's not easy to explain, so I'll see if I can find a photo to show it (edit: above), but there's a mid-way section on the upright chimney stack which steps in at 45 degrees before the then-narrower brickwork continues up. Let's call this the hip, but only because I heard someone else refer to it as this once. The hip. 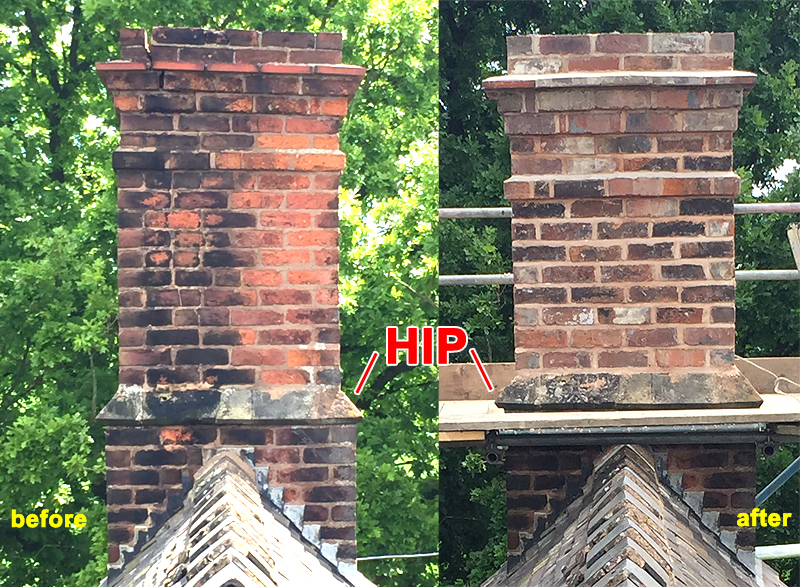 The hips on The Lodge's two chimney stacks are made of sandstone, with the remainder of the structures being brick. Being a solid piece of sandstone going right around each stack, this provides a good deal of support for what's above it. But the hip on the east stack overlooking the main road was... kind of missing bits. Quite large bits. In fact about a quarter of it wasn't really there at all. It seems that the severity of the aforementioned fire - from the Dining Room fireplace this time - had blasted the inside of the hip back to its component parts over a significant area so that the support provided by it was minimal to say the least. So while we were on our hols a heavy-duty steel box-frame was made to sit on the hip and go all the way around with a cross member bisecting it to cut between the two flues. Sadly we don't have a photo of this yet because it was made and set in place while we were away, but I'll see if I can get one. Then the rest of the stack was rebuilt with 5 sand / 2 lime / 1 cement to give it some breatheability while still being strong as bull for extra support. We would have liked a pure lime mix with no cement but we've had to compromise for the sake of safety. Apparently that's quite important. One thing we don't want is to finish the stacks with unsuitable or mismatched chimney pots, so we've been idly looking around for a couple of months now. The one and only pot on The Lodge now is a damaged yellow king or queen crown/bishop pot (depending on who you ask). So we wanted four new pots altogether and finding that many undamaged ones that are 'period', reclaimed and that you like all in one place isn't a simple task. But with the time quickly approaching (about half regular speed) to find some, we remembered a set of four deep brown salt-glazed Crown pots that we were interested in some weeks ago. One had a small repairable chip but we were willing to overlook that in favour of getting a matching set. When we finally arrived at the reclamation yard in Staffordshire it was a relief to see they were still there... but so were some others. There were plenty of red ones, which seem relatively common, and four slightly shorter orangey Queen pots caught our eye too. So after thinking about it over hot chocolate and cake in the cafe we plumped for the red ones so they'd be easier to replace like-for-like if one were to get damaged. But when we started pulling them all out we discovered so many different styles, voiding our argument entirely, that we went for the orangey ones because they were undamaged, matching, and supposedly more unusual based on our admittedly limited research. They cost £450 (I know, I know, but we negotiated down from £580!) and need cleaning up a little bit, but in the meantime I'll email a photo to the reclamation yard to ask about their provenance (the fella we were told to ask wasn't in at the time) so we can carry some of its history back to The Lodge if we can. The next task is to find unobtrusive rain/bird guards so we don't spoil the character of the pots... which we'll forget about anyway once we're back down at ground level. But it's all about the detail, isn't it. The sloping timber planks that face the edge of the roofline up to the apex? Painted or stained, and sometimes they're plain or carved all fancy and decorative - they're the bargeboards. And I wanted to check and repaint ours while the scaffolding was up. Paint over it. Nobody will notice. Mistakenly, and I'm braving-it-out by admitting a Rookie Mistake here, I managed to waste a whole day stripping paint off one of the outer boards without checking what it was covering. I had noticed mismatched architrave bordering the bargeboards on both apexes but I didn't think much of it until the next day when I realised the architrave must be covering something - and it was. Lots of rot. A couple of inches of the ends of all four boards and portions of the long edges on a couple were ruined and had been bodged, filled and painted-over quite badly over the years. I painstakingly managed to pull all of the boards off but with ladders on top of scaffolding to help the process along at the apex above Bedroom 1, it didn't do much for my nerves. Likewise the denailing process. The timber behind the boards is a similar story in part, which is going to increase the cost we think. A couple of the rafters are also showing signs of rot and we don't yet know if they can be repaired or they'll need to be replaced. If it's the latter at least we already have the roofer on board and the scaffolding up. Every cloud. And so begins the process of deciding on the new bargeboards, which sounds easy enough but we need to decide on the timber type, which carpenters to contact (could I make them myself? ), detailing, colour and the type of breatheable stain/paint we'll use. The good news is that because the back (north side) of The Lodge doesn't bear the brunt of the weather we think the boards there will be in better condition. We can't check that just yet because the scaffolding doesn't go around that way and we have swallows nesting with fledglings in the apex. The long arm of the law has something to say about disturbing them (and they're fun to watch, too), so that's a job for another day. Oh, and as an aside, the timber behind the bargeboards above Bedroom 2 had been replaced in the past and a name had been chalked on one in olde worlde script. It's either William Powell or William Fowler, we can't quite tell. Either way, Will old boy, we salute you. This blog post is dedicated to you, whenever you may be. Just a very quick post tonight to mark another first for us. It was a gorgeous day today up on the scaffolding and a lovely warm, sunny evening followed so we went for a walk through the woods. 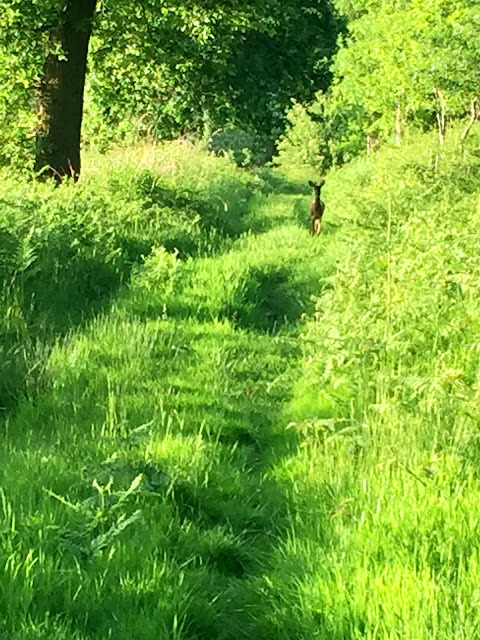 And we saw our very first deer. I think it's a roe but I stand to be corrected. She was chomping merrily away at the grass to the side of the path we were on, and we thought she'd bolt when she spotted us - but no. Instead of heading for cover she spent about 40-50 seconds walking slowly and cautiously towards us. Stopping. Bobbing her head up and down for a better view/whiff. Walking... stopping... bobbing... getting closer all the time. Very brave. ...and then she was gone. Off in to the safety of the ferns. There I was minding my own business up the scaffolding, scraping paint, when I heard the hum of a tractor engine heading up the road from the village. Usual stuff. It got steadily louder and louder to the point where it really should have been in sight by n... HOLYMARYMOTHEROFGOD IT'S A MASSIVE SWARM OF BEES!!!1!! Gravity certainly played more of a part than it should have as I departed the scaffolding and near-teleported myself in to the house, slamming the door firmly behind me. I even briefly thought about locking it... it's fair to say that I had a little bit of a panic on at the time. So I did what any man in my position would do - I rang Dawn at work 20-odd miles away and demanded she do something about it. NOW. I calmed down a little during our brief-but-urgent conversation, during which time I worked out that the swarm hadn't been looking to settle right on my face like a humongous undulating bee beard - as I had naturally assumed it would, but instead it had decided to take a break in the front garden, right in front of the shed. Dawn managed to persuade me to go gingerly back outside "and take lots of photographs", and still high on the unexpected rush of adrenaline I did just that. At great personal risk, I must add. I mean, what if they were the mutant killer kind from Africa or something? ...and the sound as the swarm swamped a scabby old fir tree in the garden was absolutely astonishing. It was as though the air was full of white noise, but on a lower frequency and at deafening volume that drowned all other sounds out of existence. It was very, very impressive. While I took pictures, gradually getting braver and closer to the big ball of unpredictable stinging things, Dawn texted me some telephone numbers for people who could come and rescue me. Fortunately one of the blokes was just 10 minutes away and I was still staring mesmerised at the swarm when he arrived. I instantly snapped in to Must Ask Lots of Excited Questions mode, and the summary of what I learned was that it was a reasonably small swarm - about 15,000 bees, and they had probably split off from their main colony, maybe because they had outgrown their hive - the Queen had just upped and left, leaving loads behind. It's also possible that another Queen had been hatched, and because there would normally be a fight to the death between the two, the original had got while the going was good, taking a loyal band of followers along with her. They were also at their most docile while swarming because they would have had a good old feed before heading off and their bellies would be too full of honey to bend much to get the stinger in anyway. I also learned that amateur beekeeping is a cutthroat world - my saviour reckoned they had likely come from an apiary over towards the village but because he was collecting them he was going to stick them in one of his own empty hives. Finders keepers and all that. That's why there would be no charge. Did you read the post about me asking the deer hunter if I could join him for a little while a few days ago? You might remember that the question just fell out of my mouth without any intervention from my brain. Well, that's how I ended up in a bee keeper's suit today. I quite like this new impulsive me, although the bee keeper seemed to be a little bit perplexed by my enthusiasm. He kept looking at me funny. Because the suit in question was only the top half with the mesh hood, I took the sensible route and tucked my trousers in to my jazzy pink socks and found some gardening gloves. I looked every inch the proper pro. Two minutes later the bee keeper had snipped the fir branch the swarm had settled on, dropped it in to a wicker basket and popped it on the ground with a blanket over the top to keep the sun off... and that was it. The idea was that the rest of the bees would head inside through a small hole that had been left for them. He pointed out that of the hundreds of bees hanging around just outside the basket, the ones with their backsides in the air were calling the stragglers over by emitting pheromones, while a couple of thousand still in the tree were confused by pheromones still up there, so he would leave the basket where it was for an hour while he headed off somewhere else. Which he did. On his return he snipped another branch off in to the basket but there were still a good couple of thousand bees hanging around that had gone uncollected, so he decided to abandon those ones and let them take their chances. At that he popped the basket on the passenger seat of his little hatchback, put the seatbelt around it and pootled off with a cheery wave. And that was that. Ten hours later as I type this the remaining bees have consolidated in to a tight ball in the tree for the night and have gone almost perfectly still and silent. It's a bit eerie to watch. It remains to be seen what they'll do tomorrow, if anything, but I hope they find a good home to go to because honey bees are important. The future of the human race depends on them or something, so I hear. If you find yourself at the mercy of a million angry bees, log on to http://www.bbka.org.uk/help/find_a_swarm_coordinator.php and stick your postcode in the box. Rescue is just a phone call away. As any health and safety professional will tell you, the best time for anyone without a head for heights to climb a bouncy ladder and prance around on rickety scaffolding is during gale force winds when there's nobody around to see you go splat on the ground below. The red line shows where the bricks are parting ways. The 'scaff', as we experts like to refer to it, started going up at 7am on Saturday (that's not a typo - it was 7am) in readiness for pretty extensive chimney and roofing work which is likely to take a few weeks. Dawn and I headed up there as soon as the van was out of sight to have a look around and take a few pictures and I was back up today to do a few jobs while my better half was at work. And because I'm a brave little soldier I ignored the severe weather warning for high winds, telling myself that if I didn't get the jobs done now I'd have to use a ladder when it's all taken down. And I'm not good on ladders. Or even standing on chairs, for that matter. The main thing that we noticed was the state of the stack on the east side. We could see from ground level that it was already leaning towards the road, but being level with it revealed that the upper half is badly cracked and starting to peel apart like a banana, leaning not only to the east but to the south too. The lead flashing around the chimney stacks looks as though it has been thrown at the brickwork from ground level by a child in the hope that some would stick. Numerous cracked/missing tiles and valley tiles. Cement-based pointing more-or-less everywhere (to be replaced with lime) which is cracking, falling out or just downright ugly. Random red tiles around the bathroom Velux window and a weird corrugated plastic sheet below it which has no tiles covering it at all. A wisteria plant which was long-dead (and is now on the Things To Burn pile) had become bored with its trellis on the front of the building and gone exploring under the roof, damaging laths and tiles - the extent of which we don't yet know. Three missing chimney pots and no flue caps. The one remaining pot is damaged. The wooden bargeboards leading up to the two apexes are rotting in places and may need repairing somehow or replacing altogether. With this final point in mind, one of my scaffoldy jobs is to get the already-flaky paint stripped off the bargeboards completely to see what kind of condition they're in. And that's tomorrow's job. Fortunately the wind should have died down by then, which is a very good thing - I'm going to need stepladders or something to reach the highest apex above Bedroom 1, and that's not exactly filling me with happy thoughts right now.